Buying Organic can be expensive, so if your food budget is limited, read on. The Dirty Dozen are foods you should always buy Organic (or from local farmers/gardeners who use organic methods) to avoid pesticide/herbicide contaminants. Additionally, the EWG adds 6 additional foods for which Organic is recommended. Buying Organic for any foods on this list provide paybacks in better health and lower disease risk. The Clean Fifteen are foods that you could buy conventional if your budget is pinched, because they typically are not sprayed, or they have thick skins through which the sprays will not penetrate. Additionally, the EWG adds 4 additional foods you can safely buy conventional. Cat’s Caution: If you eat the skins (I put skins of Orange/Grapefruit in my morning smoothie), then you should buy Organic. Want a printable wallet-size list to use when you go grocery shopping? Green Smoothie Girl has a printable wallet-size lists of the Dirty Dozen and Clean Fifteen (4), if that interests you. 14. Leafy greens: lettuce, kale, chard, etc. These foods should make up a large portion of your whole-foods diet, so it’s important to get quality, clean greens for your smoothies and salads. Due to increasing demand, you can find washed leafy greens nearly as cheap organic as conventional. 15. Coffee: Coffee is one of the most-sprayed crops globally. It’s better for your health and the environment to choose Organic joe. For Organic, Free-Trade brands of coffee; see Amazon (6); the brand I use is Columbia Joe (7) . 16. Eggs: The natural omega fatty acid balance is so disrupted in conventional eggs that it’s the reverse of what is healthy. It should be 6:1 Omega 3’s to Omega 6’s. But it’s the opposite in conventional eggs, and folks eating the SAD are already far out of balance. Choose organic eggs for a more natural ratio. 17. Meat: If you’re going to eat meat, always choose clean, organic sources. 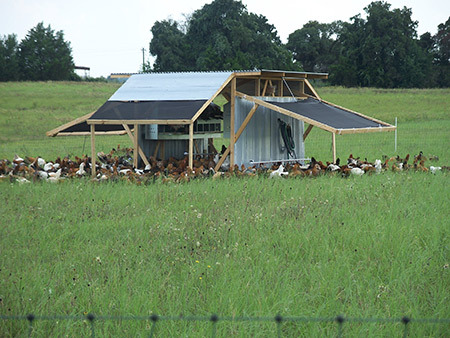 Organic livestock is raised without antibiotics and steroids, and have access to the outdoors. Their feed cannot contain animal by-products, GMO grains, or be grown using non-organic fertilizers. Look for free-range poultry, and grass-fed beef. The best is that raised and finished in local pastures. See Farmhands Interactive Map from Nourish the Flathead (8). 18. Dairy: If you can’t do without dairy products, make sure they’re organic, for the same reasons you want clean meats. The best organic dairy comes from grass-fed animals. Additionally, if you want to avoid GMO produce, varieties of papaya, summer squash and sweet corn and soon apples and potatoes have been approved for GMO, so be sure to consult with the seller about these if you don’t want to buy Organic varieties. ‘* A small amount of sweet corn, papaya and summer squash (and soon-to-be apples and potatoes) sold in the United States is produced from genetically modified (GMO)seeds. Buy organic varieties of these crops if you want to avoid GMOs. 17. Produce with thick skins or rinds, which can be removed: Melons, citrus fruits, bananas, squashes. Note, however, that if you plan to eat the peel of any on this list, your best choice is Organic. 18. Quinoa: The tough outer coating is nearly impermeable to pests, so growers don’t spray it. 19. Maple Syrup: Real maple syrup is forest-harvested from untreated trees. What about foods not on either list? Read labels, and use good judgment. When in doubt, go organic when your budget allows (and maybe even grow some of your own veggies!). This entry was posted on Monday, March 13th, 2017 at 12:51 pm and is filed under Agriculture, Ecology, Food-Nutrition-Health, GMO, Organics. You can follow any responses to this entry through the RSS 2.0 feed. Responses are currently closed, but you can trackback from your own site.